Director/Production Design – Don Bluth, Screenplay – Stu Kreiger, Story/Songs – Judy Freudberg & Tony Geiss, Producers – Don Bluth, Gary Goldman & John Pomeroy. Production Company – Sullivan-Bluth Studios/Amblin. The Upper Cretaceous era. The Earth’s changing climactic conditions are causing the leaf-eating dinosaurs’ vital food to die off. After the death of his mother, the baby brontosaurus Littlefoot leads a motley expedition of orphan dinosaurs in search of a mythical valley where enough greenery exists for them all to live in peace. The Land Before Time was the third film from Don Bluth. Bluth was a former Disney animator who set up his own studio and since the 1980s has carved out a steady reputation as a provider of alternate animation. Bluth’s first and best film The Secret of N.I.M.H (1982) prefigured the Disney revival of the 1990s, making an exquisite return to classic Disney animated form. However, The Secret of N.I.M.H. was not the success it richly deserved to be. Don Bluth next teamed with Steven Spielberg for An American Tail (1986) and The Land Before Time, sacrificing higher artistic ambitions for more commercial material. Subsequently, Bluth made such banal fare as Rock-a-Doodle (1991), Thumbelina (1994), A Troll in Central Park (1994) and The Pebble and the Penguin (1995), before returning to A-budget animation with Anastasia (1997) and Titan A.E. (2000). Cold-blooded dinosaurs that had brains the size of peas seem unlikely candidates for cutsie anthropomorphism but Don Bluth pulls it off here. The intention is clearly to create a prehistoric Bambi (1942), although The Land Before Time never moves one like Bambi did. It treads all the maudlin ups and downs of animation cliches – the child-like talking animals, simplified but never too-threatening dangers, and a nice outcome. We even learn there is a dinosaur Shangri-La and afterlife. A certain liberal subtext runs through the film – its equation of Leaf-Eaters as the good guys, Meat-Eaters as the bad guys, and there is a veiled commentary on depletion of planetary resources, which shows the film to be written with an ear towards preaching contemporary environmentalism to the young. Don Bluth has toned down the more elevated artistic ambitions that he showed in The Secret of N.I.M.H. 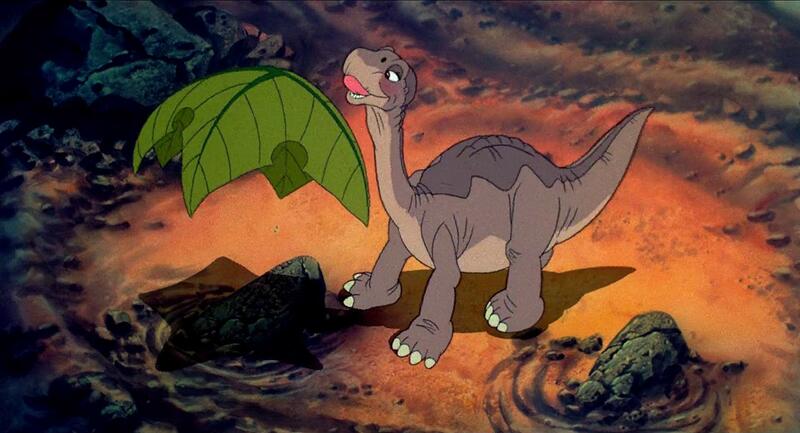 and The Land Before Time is much more simply drawn, not unlike tv animation. It still works, with some moments such as the mother’s supernatural appearances having a nice soft-edged lyricism, or the moment where Littlefoot goes running off, mistaking his own shadow for his mother’s. It proves to be a likeable enough effort. Disney later stole the basic idea for their big-budget Dinosaur (2000). In the 1990s, Universal without Bluth’s involvement produced an interminable series of video-released Land Before Time sequels, all pitched at very young audiences. These include:– The Land Before Time II: The Great Adventure (1994), The Land Before Time III: The Time of the Great Giving (1995), The Land Before Time IV: Journey Through the Mists (1996), The Land Before Time V: The Mysterious Island (1997), The Land Before Time VI: The Secret of Saurus Rock (1998), The Land Before Time VII: The Stone of Cold Fire (2000), The Land Before Time VIII: The Big Freeze (2001), The Land Before Time IX: Journey to the Big Water (2002), The Land Before Time X: The Great Longneck Migration (2003), The Land Before Time XI: Invasion of the Tinysauruses (2004), The Land Before Time XII: The Great Day of the Flyers (2006) and The Land Before Time XIII: The Wisdom of Friends (2007), followed by a cartoon series The Land Before Time (2007-8). There was even a series of Land Before Time Singalong Songs.